An airplane's digital flight-data recorder, or "black box," holds massive amounts of data, documenting the performance of engines, cockpit controls, hydraulic equipment and GPS systems, typically at regular one-second intervals throughout a flight. Inspectors use such data to reconstruct the final moments of an accident, looking for telltale defects that may explain a crash. More recently, analysts have probed black-box data in an effort to prevent such accidents from ever occurring. Using software tools that can rapidly search data, operators can flag problem areas and determine whether a plane needs to be pulled off the line to be physically inspected, or if there are problems with flight procedures. Many airlines routinely run software programs to check a plane's overall health and performance after each flight. However, John Hansman, professor of aeronautics and astronautics and engineering systems at MIT, says today's search methods are limited, with operators needing to identify ahead of time which parameters to check. Hansman says this approach may cause analysts to miss key information that would otherwise help airlines improve aircraft safety and operations. Now Hansman and his colleagues at MIT and in Spain have devised a detection tool that spots flight glitches without knowing ahead of time what to look for. The technique uses cluster analysis, a type of data mining that filters data into subsets, or clusters of flights sharing common patterns. Flight data outside the clusters are flagged as abnormal; analysts can then further inspect these reports to see whether an anomaly is cause for alarm. The group includes postdoc Maxime Gariel, graduate student Lishuai Li and Rafael Palacios, an assistant professor at the Institute for Research in Technology at Comillas Pontifical University in Spain. Hansman will present a paper on the technique at the 30th Digital Avionics Systems Conference in October. Currently, commercial airlines in the United States monitor black-box data on a voluntary basis, following guidelines set by the Federal Aviation Administration's Flight Operations Quality Assurance (FOQA) program. Airlines that observe FOQA are expected to regularly monitor a "watch list" of 88 flight parameters throughout each flight, including the pitch of a plane at takeoff, the speed at takeoff and landing, and the time at which a pilot retracts a plane's flaps. The watch list generally focuses on crew actions rather than mechanical performance. However, the number of aircraft sensors has ballooned over the years, and a flight-data recorder on a Boeing 787, for example, is now able to record 2,000 flight parameters continuously for up to 50 hours  a much richer dataset than what is typically monitored. To get a more complete picture of an aircraft's operations, Hansman and his colleagues took cluster analysis, a common statistical approach, and tailored it to black-box data. The team first mapped flight parameters in terms of vectors. Each vector represents all the parameters from a single flight. The researchers then plotted vectors from multiple flights in a multiple-dimension "hyperspace." Vectors with similar measurements clustered together, representing "normal" flights. The outliers, or vectors outside the data clusters, signaled flights with potential problems. "The beauty of this is, you don't have to know ahead of time what 'normal' is," says Hansman, "because the method finds what's normal by looking at the cluster." The researchers tested the technique on flight data they obtained from an international airline that no longer operates. The dataset comprised 365 flights, all flown on Boeing 777s. The flights took place over one month, with various origins and destinations. Each flight included measurements taken at one-second intervals, including aircraft position, speed, acceleration, winds, and environmental pressure and temperature. The team mapped each flight at both takeoff and landing, finding several flights that stuck out from the normal cluster. Hansman says the anomalies were due mostly to crew actions, versus mechanical problems. After examining the data more carefully, the team found that one flight took off with significantly less power than most, indicating either an incorrect thrust setting by the crew or a potential power-systems issue. Another takeoff had erratic pitch behavior, indicating that the pilot had difficulty rotating on takeoff. A third flight was identified as being low on approach, with a higher-than-normal flap setting, creating drag that forced the plane to apply more thrust than usual before landing. Co-author Lishuai Li hazards a guess that cluster analysis could have helped prevent an accident on Dec. 8, 2005, when Southwest Airlines Flight 1248 slid off a runway at Chicago's Midway International Airport and crashed into traffic while attempting to land in a snowstorm. Li says the accident was due in part to the pilots' failure to activate reverse thrusters in time, but that the cluster-analysis technique could have picked out such late-reversal thrusts in prior flights, and flagged them as potential problems. "The identified anomalies would raise attention in the use of reverse thrust and its impact of landing performance," Li says. "This accident could have been prevented." Hansman aims to test the technique on a richer dataset in the near future, though he acknowledges that getting a hold of information from airline flight-data recorders can be tricky, mostly due to restrictive labor agreements on how the data can be used. He is currently in discussions with several airlines, as well as NASA, in hopes of acquiring more flight data. "We're in an era where we have very few accidents, which is a good thing," Hansman says. "But if there are emerging safety problems, you don't want to wait for an accident, you want to find it ahead of time." 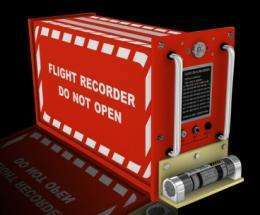 Getting a hold of information from airline flight-data recorders can be tricky, mostly due to restrictive labor agreements on how the data can be used. Bah! "labor agreements", my foot. If I were the FAA I'd tell them that this is security research and you can stuff your labor agreements up your chimney. If pilots talk about issues in the cockpit that they don't want people to know, then in my book, they have the wrong attitude. They should be there working and not showing each other pictures of their last adulterous trip to the beach. Similarly, if someone has a problem keeping the airplane in the air, then it is our _duty_ to know about it, way before the day he encounters side wind.